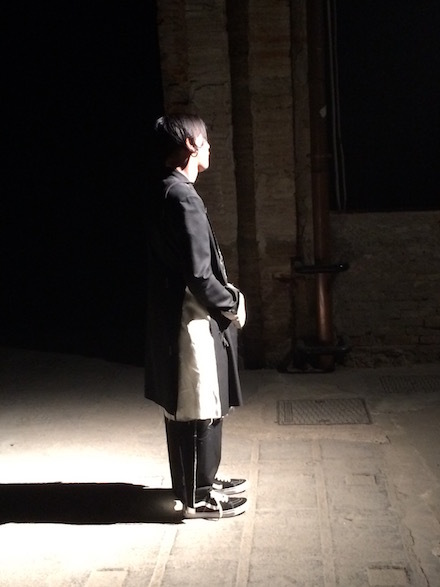 Yes, I was impressed by meeting Sulvam‘s creative power at play Teppei Fujita in Florence, for Pitti Uomo. So much so that I took a bunch of photos of him interacting with journalist and fashion enthusiasts, and even asked his publicist to take a few photos of us together. The man is iconic, his fashions grandiose and unafraid and I love menswear that I can appropriate, right here right now. So, if your fancy is tickled, here is a link to a mini-interview that I did with Fujita himself. A bit could be lost in translation but that’s somehow cool too when it comes to this man. And here is a special treat, a bit of the show on video. N-joy! This entry was posted on Monday, January 23rd, 2017 at 8:14 am and is filed under Interviews, Man's Opinion, Style Icons, Woman About Town.